LARGEST HOUSING DEVELOPMENT IN THE THAMES GATEWAY SECURES PLANNING. 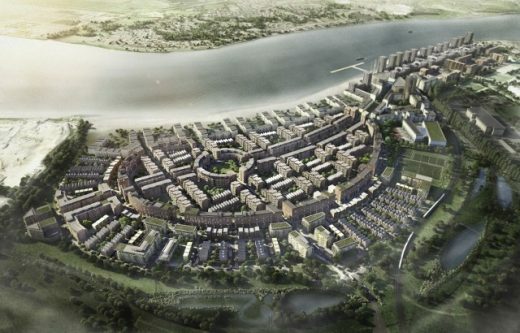 Sheppard Robson, in partnership with Maccreanor Lavington and KCAP, have received planning for the first 4000 homes of the £1.9 billion regeneration of Barking Riverside in the Thames Gateway. Sheppard Robson has gained planning for 1500 units in Stage One and Maccreanor Lavington with KCAP have gained planning for the remaining units in Stage Two. The project includes two new schools, a community centre and wide scale public realm enhancements – marking the beginning of a transformational regeneration scheme for Barking Riverside Ltd – the joint venture between Bellway Homes and the Homes Communities Agency (HCA). The plans submitted to the London Thames Gateway Development Corporation (LTGDC), proposed emphasising wide open spaces and high quality family housing. Sheppard Robson, in partnership with Maccreanor Lavington and KCAP, has submitted planning for the first 4000 homes of the £1.9 billion regeneration of Barking Riverside in the Thames Gateway. Sheppard Robson has submitted planning for 1450 units in Stage One and Maccreanor Lavington with KCAP have submitted planning for the remaining units in Stage Two. The project includes two new schools, a community centre and wide scale public realm enhancements – marking the beginning of the Bellway Homes and Homes Communities Agency (HCA) regeneration project. The plans were submitted to the London Thames Gateway Development Corporation (LTGDC), with the proposal emphasising wide open spaces and high quality family housing. Subject to planning approval, Stage One will begin on site this year, due for completion in 2016. Stage Two will begin in 2012, due for completion in 2020.